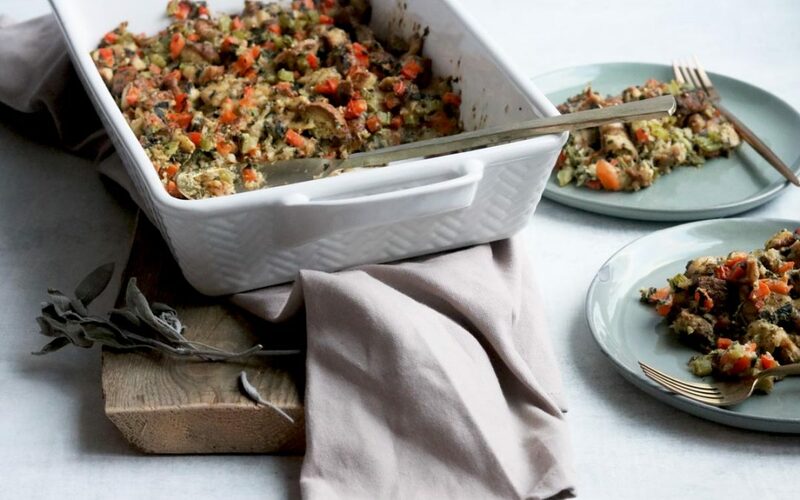 Inside Scoop: This Simple & Flavour Packed Gluten-free Vegetarian Stuffing will impress everyone at the table. 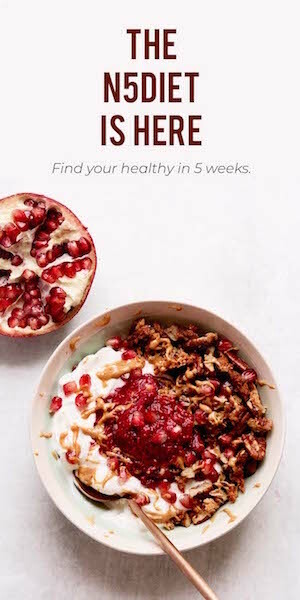 The holiday dinner is out and all you want in life is to dive into a big pile of stuffing (it’s clearly the first thing that goes at the dinner table), but you can’t because…. 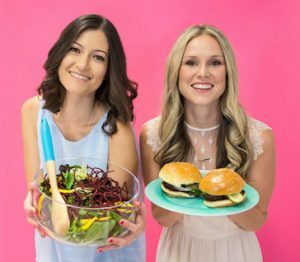 you are gluten-free. Story of my life guys. Stuffing has always been my hands down favourite part of holiday dinners, but ever since I’ve realized just how much damage gluten is doing to my gut (it’s severely compromised BTW) I have been mostly grain-free and completely gluten-free. I say mostly grain-free because I live my day to day grain-free, but when I’m all like… treat yo’ self girl, I eat a potato/ tapioca and rice based gluten-free bread, which is the easiest on my gut (see bread recommendations below). 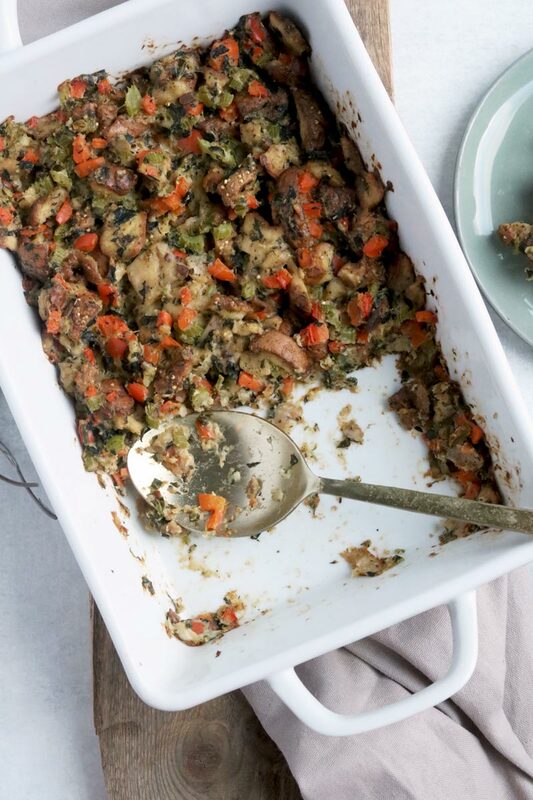 But this year, we decided Naughty Nutrition needs a gluten-free vegetarian stuffing that’s easy on the gut and totally easy to put together too. 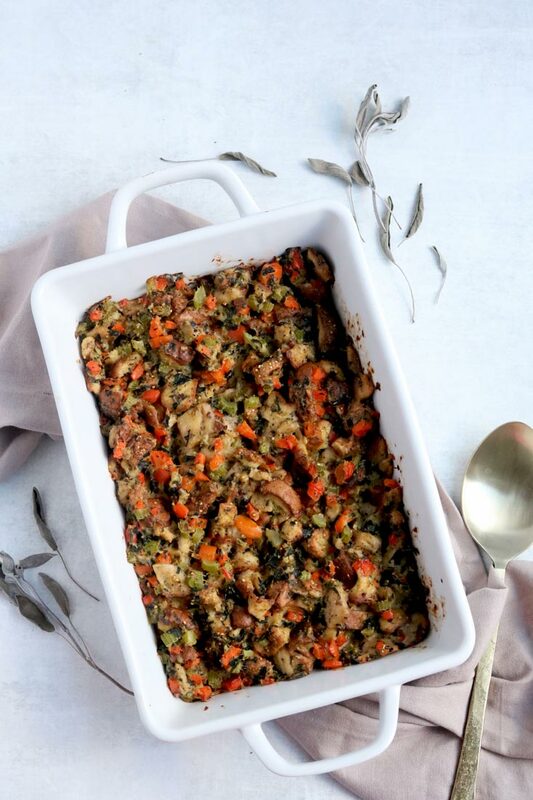 I am going to try and be humble here, but when I sat down at the dinner table with something healthy and my fiancé said ‘wow that was the best stuffing I have ever had’ (without even being told that it’s a gluten-free vegetarian stuffing), I feel as if I have bragging rights to this one. 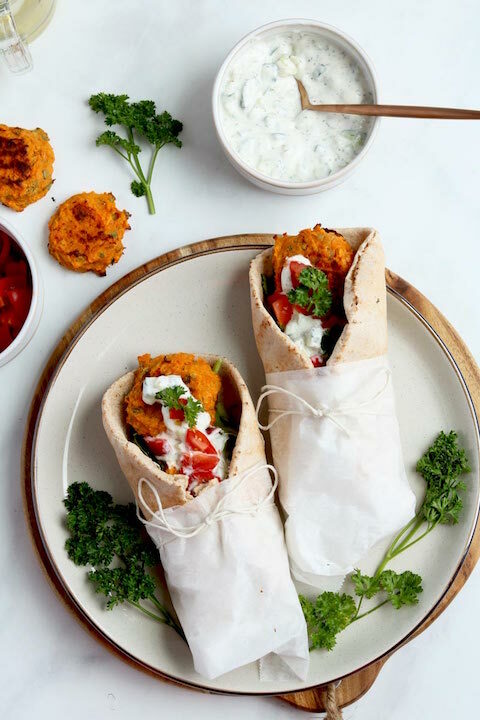 This guy is all for adding meat and cheese and ‘real’ bread to everything, so it really makes me excited when I can pass off a healthy vegetarian stuffing (that’s also gluten-free) as a delicious alternative to a traditional turkey stuffing. Also, a stuffing that has a permanent spot at all of our upcoming holiday parties. Suffice to say, I get pretty excited when I get the stamp of approval from him! 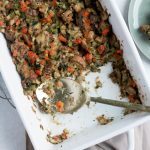 This Simple & Flavour Packed Gluten-free Vegetarian Stuffing is easily prepped in 15 minutes, is loaded with all kinds of veggies (greens, carrots, pepper, celery), contains no animal products, is made with gluten-free bread, and is LOADED with flavour. I’m under a sneaky suspicion that the bread is what’s making this Flavour Packed Gluten-free Vegetarian Stuffing a new favourite for the hubs. Because this recipe can also be made incredibly healthy (and delicious) with a traditional sourdough bread, or even a sprouted, whole grain bread, I am going to tell you my favourite tips for picking ANY bread, and what I think makes a stuffing really stand out. I used Little Northern Bakehouse Seeds & Grains loaf, which I found in the freezer section of my local grocer. 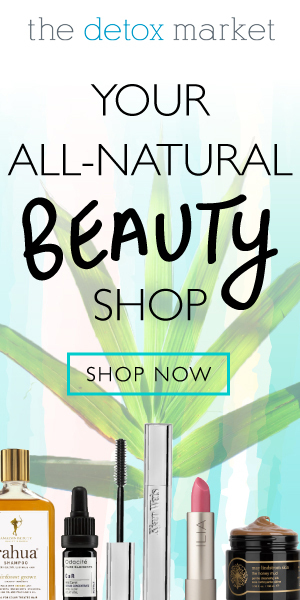 But because every location has different access to bread products, I would recommend looking for something with similar ingredients (seeds, whole grains, cane sugar). I like this brand because the blend is soft on my gut and I can have 1-2 slices without getting flared up. However, you can look for any bread you like, the fluffier the better for making stuffing. I find that dense breads can retain too much moisture, and they don’t dry out the way that ‘white’ loafs do. If you aren’t gluten-free, or are okay with sourdough, I would definitely recommend this type of a loaf. Also, another thing that is often overlooked is whether or not there are fortified ingredients in your bread. Just a little hint * if you have to add fortified ingredients into a product, it means it has little to no nutritional value to start with. 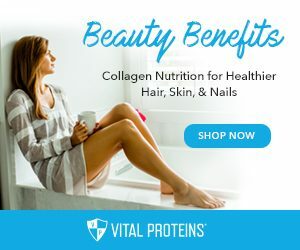 Most healthy breads will be loaded with whole grains, nuts or seeds and fiber, which have plenty of B vitamins, antioxidants and minerals, hence the need for fortified nutrients has diminished. 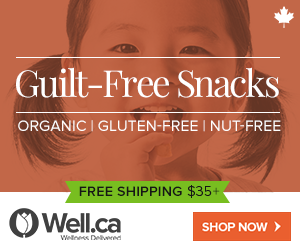 And if you are wondering whether or not going gluten-free is for you, make sure you read our article The Truth About Avoiding Gluten, And The Best Healthy Brands To Buy. Other than choosing the right bread for this gluten-free vegetarian stuffing, it’s pretty simple from there on out. All you need are some veggies, broth, eggs, and seasoning and you have yourself a healthy, veggie loaded side dish that stands out at the dinner table. If you’re looking for another healthy holiday-inspired recipe to show up to the party with, this Vegan Mushroom Gravy (which might be perfect placed right on top of that Flavour Packed Gluten-free Vegetarian Stuffing). What do you think? 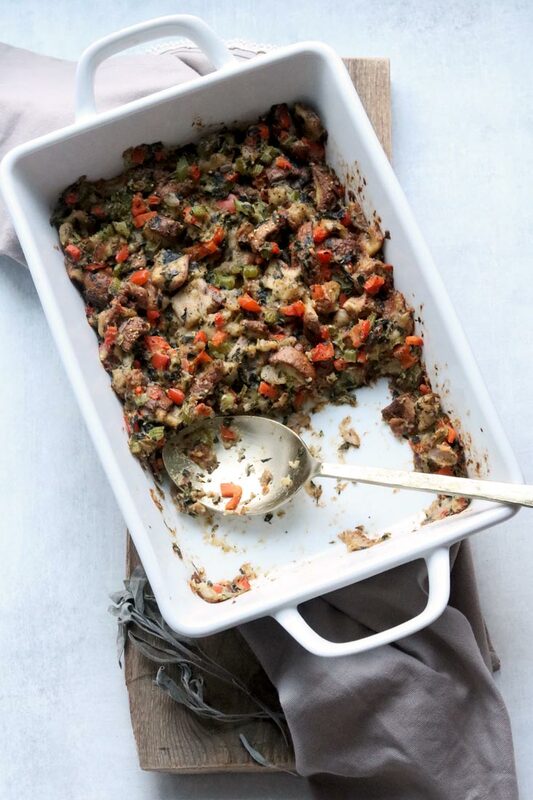 Are you going to try this vegetarian stuffing this year? 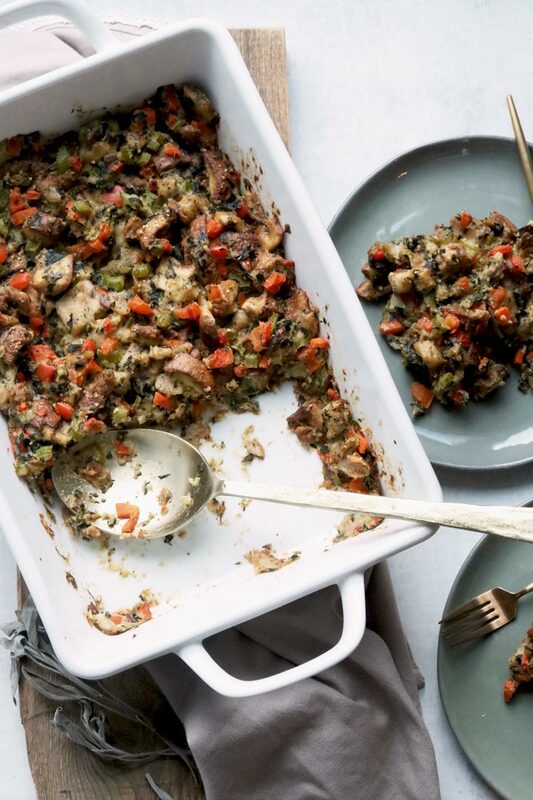 This gluten-free and vegetarian stuffing will impress everyone at the table. Cut up or rip the bread into small cubes, and set aside in a large bowl. Prep your veggies. Meanwhile, heat a large skillet over medium. Add butter, onion and garlic and cook for about 30 seconds, until fragrant. Add carrots, pepper, celery, a dash of salt and pepper and cook for about 5-7 minutes. Add greens and cook another 2-3 minutes. Remove from heat and add all of your veggies into your bread bowl and mix. Fold whisked eggs into bread bowl, along with your Herbes de provence and season with salt and pepper accordingly. Take the vegetable broth and slowly add to the bread until the bread is moistened (you may not need to use all of the broth, go slow). *If you add too much broth the stuffing will come out very moist. Add your stuffing to a casserole dish and cover and bake for 35 minutes. Remove the cover and bake for an additional 10-15 minutes, until the bread has dried enough and the top is golden and a bit crispy. *Notes: For vegan version, cook vegetables in coconut oil, and sprinkle 2 Tbsp of ground chia or flax over the bread/ make sure you thoroughly mix. Everything else remains the same.